I loved it from the very first moment. Even the slight anxiety as my first blind pair was drawn at Exeter Canal, Q1, way back in April. In fact the fun began way before the first event. As soon as the series was announced, I knew I wanted to be a part of it and I knew I wanted to be in that grand final. I hatched a plan. I've never told anyone this. Only Dan, my closest angling partner knows how I approached the competition. I set about a pretty rigorous practice regime ahead of the first event. I was certain that small Perch were the way through, but contrary to popular belief, I haven't always chased tiny Perch. And that was the first gift of BLAC. A new game to play. 2 hour blocks of intense fishing on the K&A canal. This suited my time constraints meaning I could practice here and there. The name of the game was to catch the longest length of fish in those 2 hours and improve upon my personal best. I recorded EVERYTHING and used technology to confirm what was working. A small app on my phone collected the data and I used a spreadsheet and a pivot table to tell me what lures to use and when. It only worked because I caught hundreds and hundreds of fish. Perch mostly, but not always. While everyone else was enjoying proper fishing, for proper fish, I was chasing tidlers. But it worked. And to be honest it's probably improved all of my fishing since. I remember vividly the moment that Dan and I made it to the Exeter Canal the night before the first event, with just a few minutes of daylight left to check out the venue. And the moment we saw a handful of tiny Perch in the margins and the feeling of relief and confidence that gave us. The next gift was unexpected and perhaps the most rewarding. I know a lot of anglers have been put off by the blind pairs format of the British Lure Angling Championships. I was apprehensive too. But in hindsight I needn't have worried. The collective group of anglers that I have met along the way have been awesome. Good people from varied backgrounds, all with a shared passion for lure angling. Somehow BLAC managed to pull off a series of competitive matches that remained friendly and welcoming from start to finish. 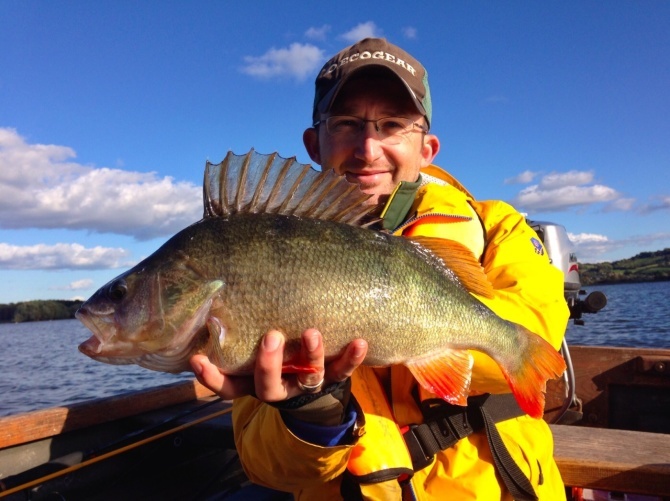 And the net result for me is nearly as many new friends and acquaintances as 12cm Perch! I really feel like I'm a part of something special. Undoubtedly next year's series will evolve and a number of new anglers will be drawn in. I can't wait to see how the number of participants swell in 2015 and I'm sure that new stars will be discovered. Please, if you're still unsure whether BLAC is for you - give it a go. I think you'll enjoy it in more ways than you might expect. The last gift was of course the televised final at Chew Valley Lake. As I said, my objective from the start was to be in the final and that was enough of a prize for me, but the fishing that Chew delivered was just staggering. My eyes were popping out my head, seeing how many Pike were coming out of a relatively small area. A bit different to my local canal. Fish soup! My own fishing didn't start all that well. Myself and my boat partner - the excellent, Ben Davis - went for a nice chug around the lake but alas we struggled to find numbers of fish. It was eagle-eyed Ben that eventually spotted the number of boats fixed around the pavilion - way off in the distance. "The fish must be there." By the end of the first half I hadn't recorded anything on the catch sheet, but we now knew where the fish were! After a refuel of sausages offered by the Polish Anglers Club - thanks gang - it was back on the water. We immediately felt more confident and Ben was shortly on the Pike. I joined in and was relieved to get a Pike on my sheet. We'd both chatted about being out of contention and agreed to have fun. It was immediately more enjoyable - even the sun came out! Away went the big rods that I thought I needed and out came a light rod that I was far more comfortable with. It's amazing how that transition can improve things for me, from the rod tip through to my arms and posture, all the way to how my head works. This felt good. And unsurprisingly I suppose, I started catching. There's a moment I will never forget. It was my third big Perch and I'd safely removed the hook in the net. I casually said to Ben that I would put this one straight back... The mouthful I got back was in hindsight well deserved. "You can't not weigh a fish like that!!" Or words to that effect. And he was right. It deserved to be weighed and this uncouth sea angler learned a valuable lesson in manners and respect. Another beautiful 3lb fish. And there you go. My BLAC. You will of course have learned by now that Steve Collett won the title with an impressive show of strength. It was a surprise to me that it could be done on Perch. Impressive stats indeed. Congratulations also to Ben Humber and John Horsey for taking the runners up positions with equally impressive hauls. And lastly my thanks. A HUGE thank you to Julian Chidgey for all the effort he invested in setting up this extensive series and undeniably raising the profile of UK lure angling. Well done Jules and well done to all the many other helpers, marshals and venue owners that made this happen. And of course Fox Rage for sharing the vision. Bring on BLAC 2015. Get involved. Nice report and fascinating to hear about the level of preparation you put in to the qualifiers. If the competition final continues to be held on Chew in late September in future years I can see Perch being the key species at every final. With the baitfish stacked up, so are the predators. The 4 inch lures is an issue though. Not that I think the rules should be changed, but competitors needs to learn how to turn more hits from little perch into fish in the boat…If I’d landed every perch that hit my lure I would have had about 20m !! I didn’t though..so the challenge is to find a way to convert more of those chances. Can’t wait for next year now…12th this year..my goal will be top ten next year. It will be hard though, I can only see the event being more competitive as it matures.